On Thursday, Moore hit arguably the best shot in the history of the hole. Using a 54-degree sand wedge, the 2004 U.S. Amateur champion slam-dunked his tee shot into the cup without a single bounce. Pandemonium ensued. That’s a legitimate winning BINGO card of iconic holes-in-one! Tiger, on the other hand, has won 14 majors over the course of his illustrious career, yet has only notched three total aces on the PGA Tour. On Friday, however, the 43-year-old would have gladly settled for an old-fashioned par on the island green instead of the quadruple-bogey 7 he ended up carding. It all happened so quickly for Woods, who got off to a blistering start to his second round with three birdies and no bogeys through his first seven holes. After pulling his first shot and watching it take an unforgiving bounce into the water off of the back of the green, Woods hit what appeared to be a perfect wedge shot from the drop area. However, the ball had the wrong spin and propelled into the water immediately after impacting the putting surface. Woods took a more conservative approach for his fifth shot, but needed two putts to get off the hole. Despite having won the Players Championship twice, Woods has now only hit the island green in regulation a smidge under 67% for his career (47/71). That’s one of the more surprising Tiger Woods stats we’ve ever come across! With the swing path his club was on, nothing good was going to happen even if he made contact with the ball . . . It didn’t get the “Better than Most” call from NBC’s Gary Koch like Tiger’s putt in 2001 but it should have. 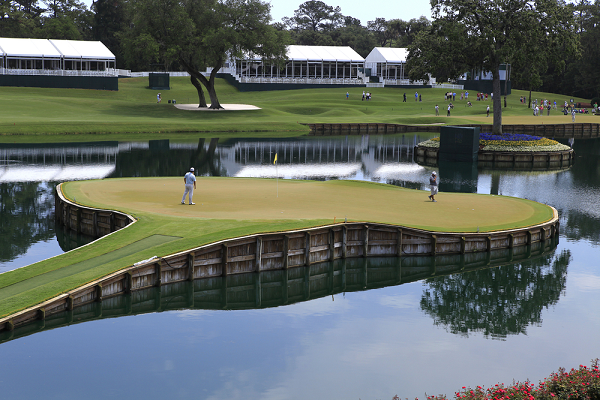 Watch Jonatthan Vegas sink the longest putt ever on the 17th green at TPC Sawgrass.